This job role is an interactive position wherein the Infant Toddler Teacher engages with the toddlers and infants by constantly grooming their activities. A well-drafted Infant Toddler Teacher Resume contains the following duties and tasks – imparting social skills and teaching in an engaging and friendly manner, maintaining portfolio of each and every infant, conducting group activities, understanding the mentality of kids, supervising infants both during indoor and outdoor activities, introducing social values such as sharing, loyalty, forgiveness, gratitude and the like to the infants. The Infant Toddler Teacher should depict these skills in their resume – the ability to provide first aid and CPR, have the potential to teach in an innovative manner, be able to comply with general and personal standards and spatial hygiene rules, be able to lift young kids, and depict record maintenance experience. Most of the candidates applying for this role have a degree or an Associate’s in early childhood development or education. Headline : 6 years of experience as an Infant Toddler Teacher. Organize and lead activities designed to promote physical, mental, and social development, such as games, arts and crafts, music, storytelling, and field trips. Able to partner with families in support of a child's growth and development. Skills : Microsoft Word, Microsoft Excel, Microsoft Powerpoint, Fax Machine, Copy Machine, And Answering Phones. Provide a safe and nurturing environment for each child which encourages their social, emotional, physical, and intellectual development. Review important decisions with his or her supervisor, and maintain positive relationships with parents, children, and co-workers. Ensure the safety and supervision of children at all times by meeting the physical demands of the position. Engage and communicate constructively with individual children during activities and routines. Respond to parents comments and concerns with sensitivity, interest, and respect. Follow state, federal, center and the NAEYC guidelines including immunizations, employment physical, and required health and safety training. Frequently lift, move, or hold children with a range of weight from 10 to 40 pounds. (occasionally lift, move, or hold weight more than 40 pounds). Supervise and interact daily with children outdoors for extended periods in varied weather conditions. Demonstrate the full range of motion to lift, reach, squat, climb, sit, and otherwise fully participate in activities. Respond immediately and appropriately to multiple or unexpected situations or emergencies. 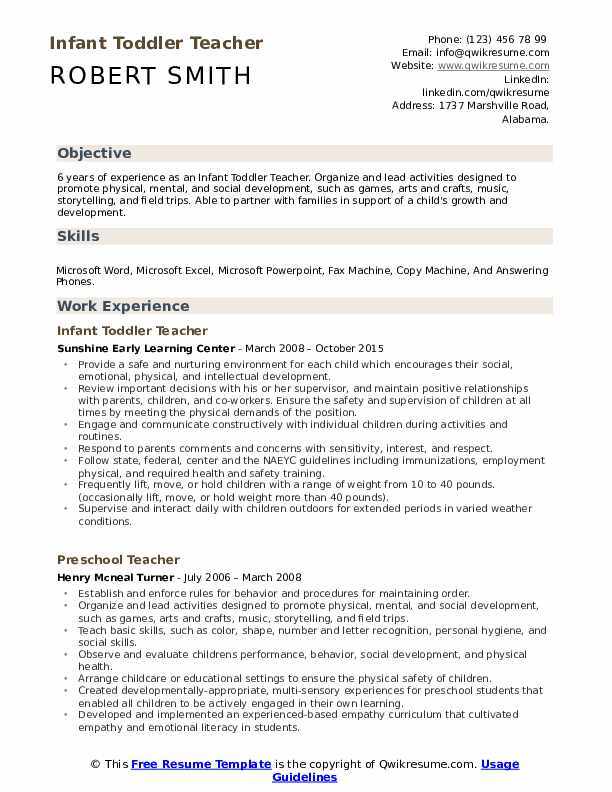 Summary : Infant Toddler Teacher with 13 years of experience, looking to bring my outgoing and detail-oriented personality into a new role at your organization. I have a desire to bring my communication skills and experience working with younger children to a new age level. Skills : Microsoft Word, Microsoft Access, 10 Key Calculator, Type 40 Words per minute, Customer service, Cash Management, Energetic, CPR and First Aid Certified. Creating and implementing developmentally appropriate curriculum for infant and toddlers. Supervising as many as 16 children while maintaining a ratio of 4 children to 1 adult. Tend to the infant's basic needs while creating a cheerful and stimulating learning environment. Maintaining daily communication with parents about the progress of their children. Supervising and training new staff members on company policies, procedures, and curriculum as it applies to the classroom. Maintaining daily records of attendance, food program and communication. Document progress of students in teaching strategy, and assess students in DECA, ASQ's, and COPA. Summary : 8+ years of experience as an Infant Toddler Teacher is seeking a challenging and responsible position to use my abilities and experience effectively and efficiently to promote a positive atmosphere and higher quality education for children. To also have the chance to learn and develop new skills in the Educational field. 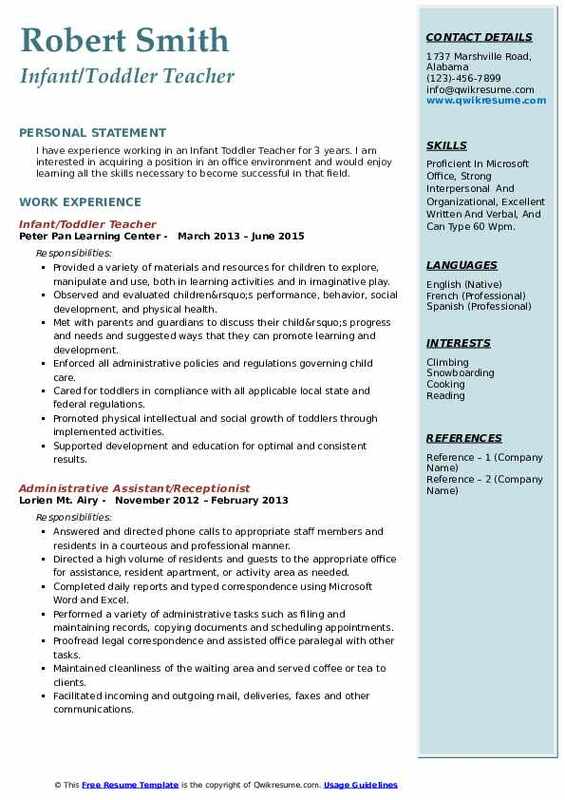 Skills : Microsoft Office, Excel, PowerPoint, DRDPs, Medical Billing, Teaching, Customer Service, And Documentation. Supervising and care for 6 infants or up to 12 toddlers as the head of a team. Using available resources to ensure a quality program for infants and toddlers. Using developmentally appropriate curriculum and learning practices and articulating those to parents and aides. Providing a respectful, responsive and reciprocal relationship with each child and their family. Working closely with other primary caregivers to ensure continuity of care. Managing student behavior in order to provide a safe and optimal learning environment. Observing, planning, teaching, and assessing practice to inform and modify instruction to meet the needs of individual children based on development. Summary : Self-motivator Infant Toddler Teacher with 8+ years of experience is seeking a position to expand administrative, customer service, and Accounting knowledge and strategies in order to excel. Goal-oriented and a team player in order to be able to meet team targets and KPIs and will support operational excellence in order to improve efficiency and effectiveness. 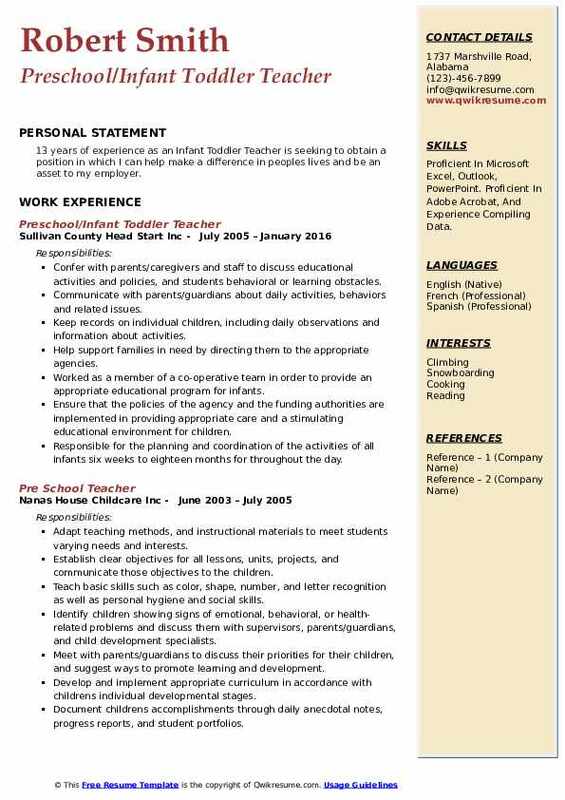 Skills : General Office, Medical Records, Microsoft Word, Office Support, Social Services, Filing Papers, Answering The Telephone, And Delivering Messages, And Microsoft Excel. Responsible for meeting monthly KPIs in order to ensure business receives funding that it needs. KPIs include documenting and supporting how many meals each child receives in order for the school to be reimbursed by the state of Missouri funding, completing lesson plans which cover all project construct model domains, completing individualized checklists, and maintaining documentation for archival purposes as needed. Currently responsible for the care of 10 children in a fast paced environment with little to no supervision. The children's ages range from 6 weeks to 2 years in age and require constant care. Ensuring all work is performed in accordance with targets determined by the project construct model. Maintaining positive work relationships with members of staff and parents of children. Responsible for participating in weekly standup meetings in order to ensure all processes are being followed and bringing up new concepts to improve efficiency for the next month. Enhancing student engagement for learning and developing at an individual and unique pace, making diverse opportunities. Establishing rapport with students, parents and critical family members, using best practice. 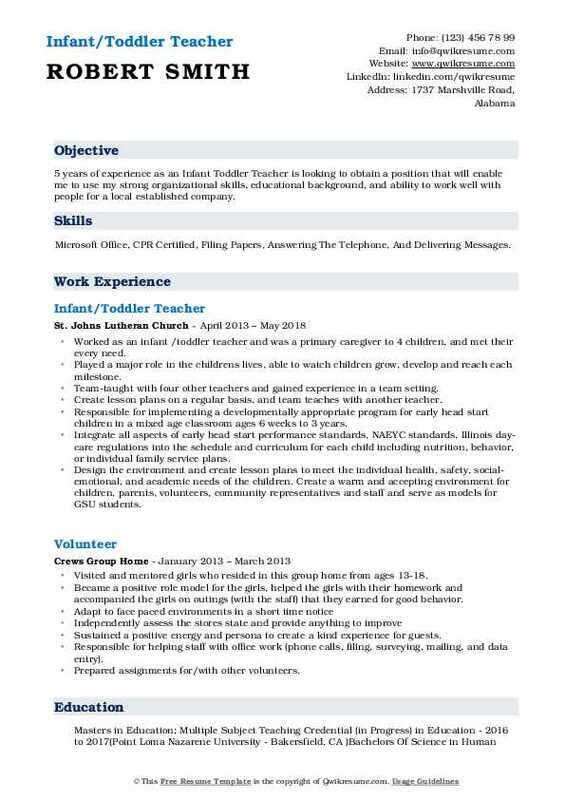 Objective : I have experience working in an Infant Toddler Teacher for 3 years. I am interested in acquiring a position in an office environment and would enjoy learning all the skills necessary to become successful in that field. Skills : Proficient In Microsoft Office, Strong Interpersonal And Organizational, Excellent Written And Verbal, And Can Type 60 Wpm. Provided a variety of materials and resources for children to explore, manipulate and use, both in learning activities and in imaginative play. Observed and evaluated children’s performance, behavior, social development, and physical health. Met with parents and guardians to discuss their child’s progress and needs and suggested ways that they can promote learning and development. Enforced all administrative policies and regulations governing child care. Cared for toddlers in compliance with all applicable local state and federal regulations. Promoted physical intellectual and social growth of toddlers through implemented activities. Supported development and education for optimal and consistent results. 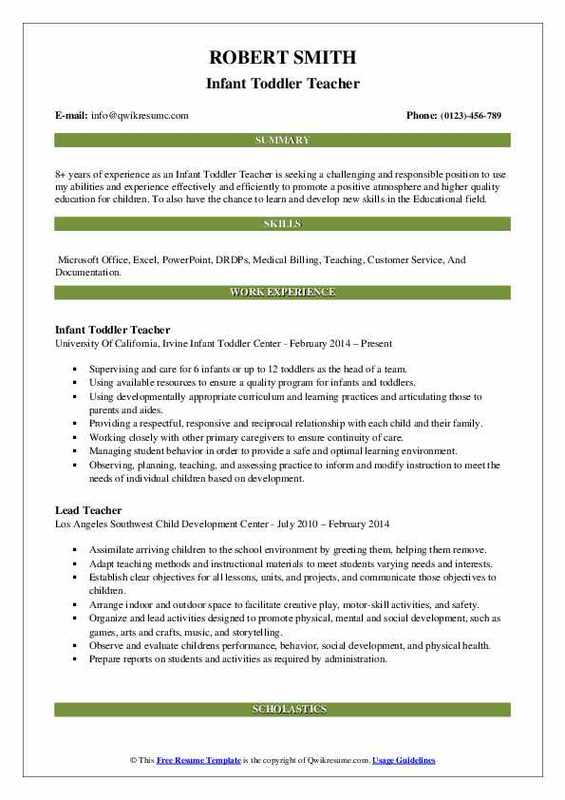 Headline : 5 years of experience as an Infant Toddler Teacher is looking to obtain a position that will enable me to use my strong organizational skills, educational background, and ability to work well with people for a local established company. Skills : Microsoft Office, CPR Certified, Filing Papers, Answering The Telephone, And Delivering Messages. Worked as an infant /toddler teacher and was a primary caregiver to 4 children, and met their every need. Played a major role in the children's lives, able to watch children grow, develop and reach each milestone. Team-taught with four other teachers and gained experience in a team setting. Create lesson plans on a regular basis, and team teaches with another teacher. Responsible for implementing a developmentally appropriate program for early head start children in a mixed age classroom ages 6 weeks to 3 years. Integrate all aspects of early head start performance standards, NAEYC standards, Illinois day-care regulations into the schedule and curriculum for each child including nutrition, behavior, or individual family service plans. Design the environment and create lesson plans to meet the individual health, safety, social-emotional, and academic needs of the children. Create a warm and accepting environment for children, parents, volunteers, community representatives and staff and serve as models for GSU students. A full-time teacher implementing best practice and following title 22 guidelines along with ITERS/ECERS. 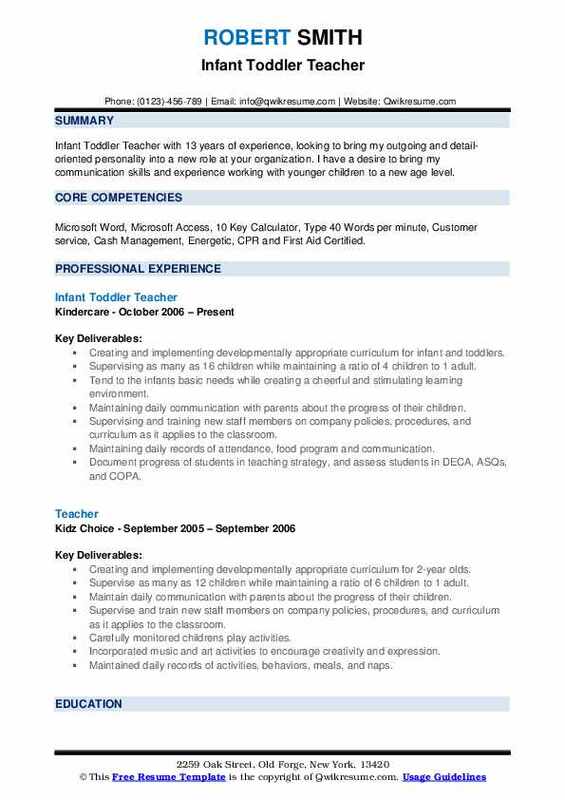 Summary : 8+ years of experience as an Infant Toddler Teacher is seeking to enter into a career that allows me to apply my education and experience while obtaining new skills and abilities. Skills : Filing Papers, Answering The Telephone And Delivering Messages Microsoft Excel, Microsoft Office, And Microsoft Word. Promoting physical, intellectual and social growth of infants and toddlers through implemented activities. Providing appropriate safety and hygiene for all developmental and learning activities. Caring for infants and toddlers in compliance with all applicable local state and federal regulations. Reporting all required information regarding infant toddler safety and care. Creating a developmentally appropriate curriculum for a toddler classroom. Planning infant and toddler educational and play activities on a daily basis. Responsible for an infant/ toddler room. Consisting of 9 children daily. Responsible for implementing the monthly curriculum that they provided. 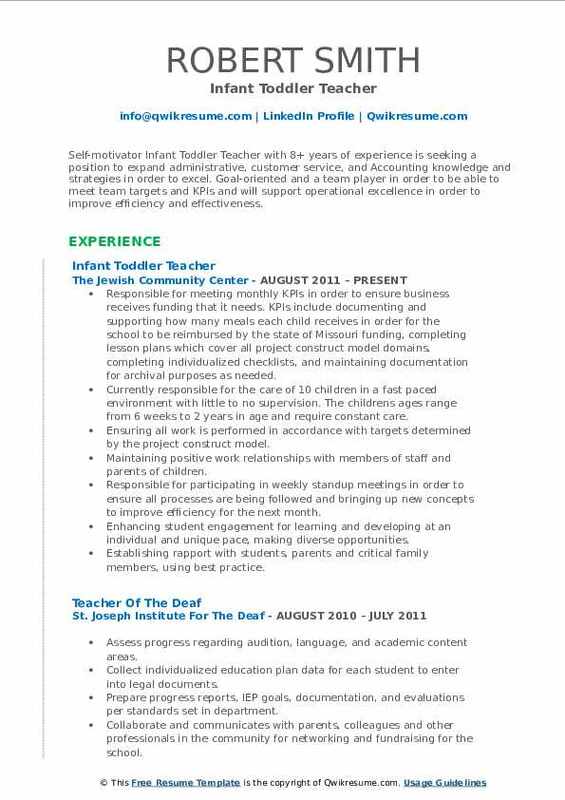 Summary : 13+ years of experience as an Infant Toddler Teacher is looking to obtain a position in a professional office environment where my skills are valued and can benefit the organization. 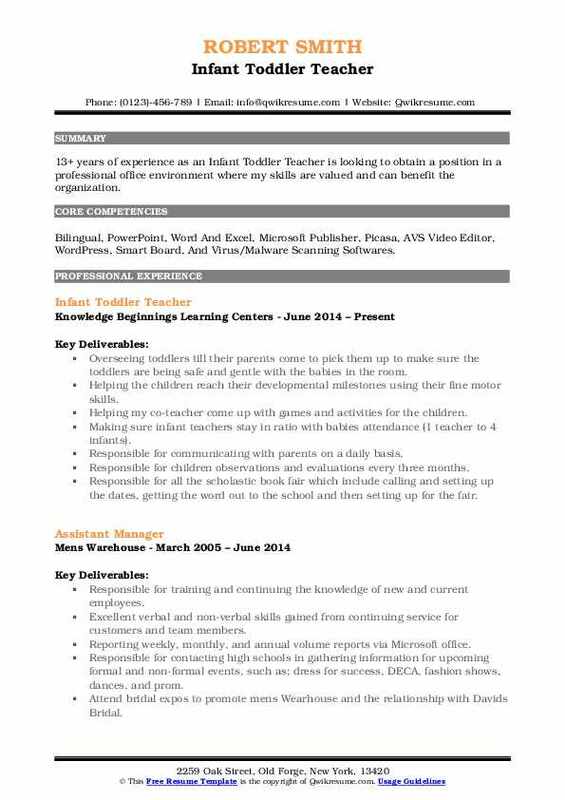 Skills : Bilingual, PowerPoint, Word And Excel, Microsoft Publisher, Picasa, AVS Video Editor, WordPress, Smart Board, And Virus/Malware Scanning Softwares. Overseeing toddlers till their parents come to pick them up to make sure the toddlers are being safe and gentle with the babies in the room. Helping the children reach their developmental milestones using their fine motor skills. Helping my co-teacher come up with games and activities for the children. Making sure infant teachers stay in ratio with babies attendance (1 teacher to 4 infants). Responsible for communicating with parents on a daily basis. Responsible for children observations and evaluations every three months. Responsible for all the scholastic book fair which include calling and setting up the dates, getting the word out to the school and then setting up for the fair. 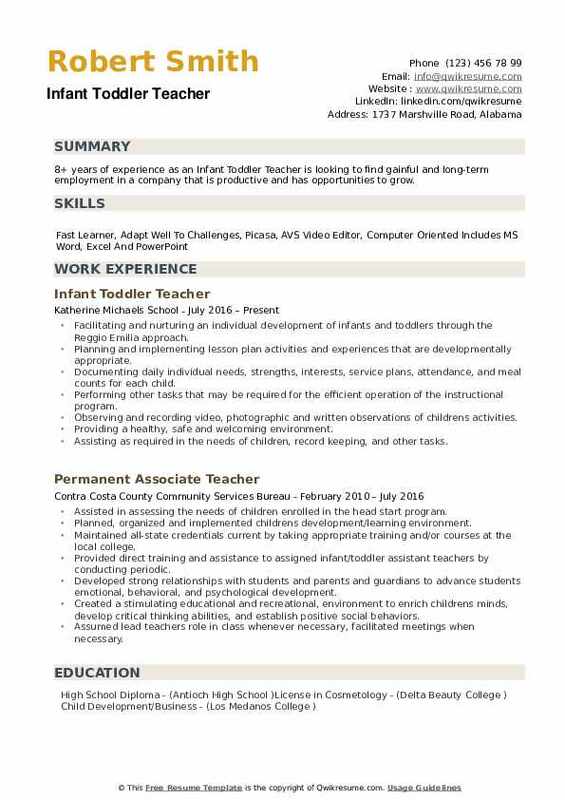 Summary : 13 years of experience as an Infant Toddler Teacher is seeking to obtain a position in which I can help make a difference in peoples lives and be an asset to my employer. Skills : Proficient In Microsoft Excel, Outlook, PowerPoint. Proficient In Adobe Acrobat, And Experience Compiling Data. Confer with parents/caregivers and staff to discuss educational activities and policies, and students behavioral or learning obstacles. Communicate with parents/guardians about daily activities, behaviors and related issues. Keep records on individual children, including daily observations and information about activities. Help support families in need by directing them to the appropriate agencies. Worked as a member of a co-operative team in order to provide an appropriate educational program for infants. Ensure that the policies of the agency and the funding authorities are implemented in providing appropriate care and a stimulating educational environment for children. Responsible for the planning and coordination of the activities of all infants six weeks to eighteen months for throughout the day. 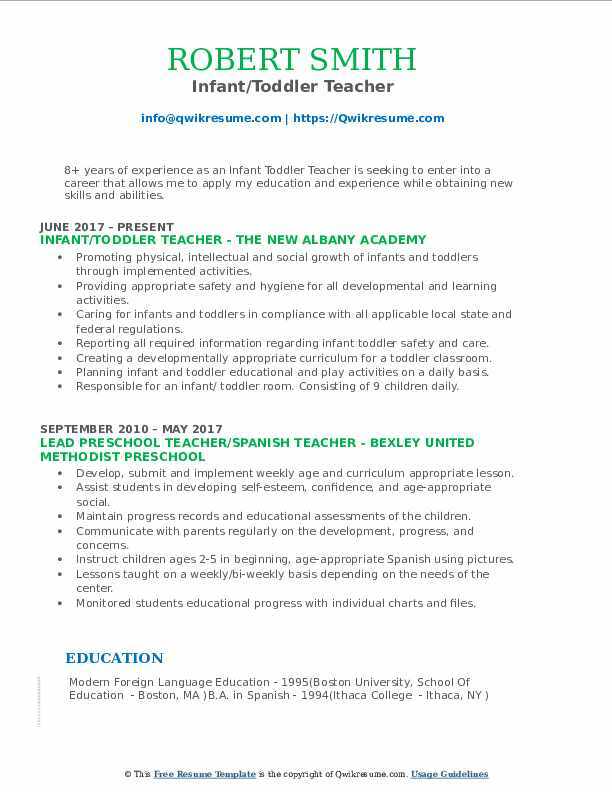 Summary : 8+ years of experience as an Infant Toddler Teacher is looking to find gainful and long-term employment in a company that is productive and has opportunities to grow. Facilitating and nurturing an individual development of infants and toddlers through the Reggio Emilia approach. Planning and implementing lesson plan activities and experiences that are developmentally appropriate. Documenting daily individual needs, strengths, interests, service plans, attendance, and meal counts for each child. Performing other tasks that may be required for the efficient operation of the instructional program. Observing and recording video, photographic and written observations of children's activities. Providing a healthy, safe and welcoming environment. Assisting as required in the needs of children, record keeping, and other tasks. Advising parents and/or legal guardians of student progress for the purpose of communicating expectations; students achievements; developing methods for improvement and/or reinforcing classroom goals in the home environment.